With the way that Destiny 2 works–allowing all players to play together regardless of which expansions you purchase–it requires each player to have the full update installed on their system. When September rolls around, Destiny 2 will require a whopping 104 GB on your PS4, according to the listing for the upcoming Forsaken expansion on the PlayStation Store. If you haven’t upgraded to a 2 TB hard drive yet, that’s a big chunk of your storage real estate. The Destiny 2: Forsaken file size won’t actually be quite that big, but that’s what will be required in order to open up some free space to download, unpack, and install updates. Currently, Destiny 2 requires 68 GB free to download and install, but the final file size once installed is only 53 GB. If I had to make a rough guess, I would say the Destiny 2 file size in September will land between 80 and 90 GB, though it will also request more space for the regular updates that Bungie makes to the game, making that 104 GB requirement you see listed on the PlayStation Store. It’s possible that this file size could change before that time. The description says “104 GB hard drive storage space required as of 9.18. 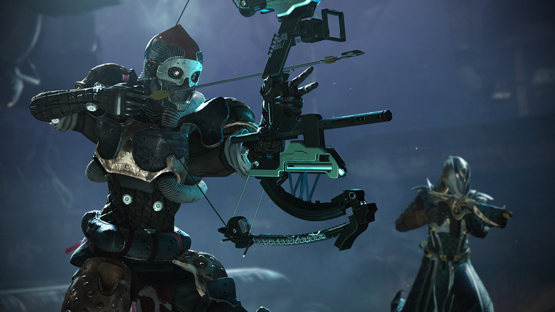 Subject to change.” We’ll know more closer to September as pre-loads begin and Bungie prepares to launch the volley of content coming with Forsaken. Meanwhile, make room on your hard drive for July’s free content update that will include a number of changes and a brand new seasonal event called Solstice of Heroes. If you’re anything like me, you’ll be searching through games to figure out what you can delete next in order to make room (yes, I have a 2 TB drive installed and a 500 GB external). Unfortunately, whether you decide to purchase Forsaken or not, you’ll be hit with this enormous file in order to continue playing. At least if you do decide to purchase Forsaken later on, there won’t be any download or wait time and you can hop right in and play. If you’re running out of room on your PS4 and don’t want to upgrade the internal hard drive, you can always use external storage to store your games. Be aware when using an external drive that they can sometimes cause DualShock 4 connection issues. What do you think of the Destiny 2: Forsaken file size? Have you seen a game that requests more than 100 GB of space to download and install?